In this episode we are talking to Clarke Price, a retired CEO of the Ohio Society of CPAs and the very first guest on this podcast one year ago. We discuss how the prevalence of social media (and the decline of respectful debate) creates new challenges for leaders and we provide suggestions on how you can overcome these challenges to provide strong leadership in your organization. The Ohio Society’s record of innovative leadership during Clarke’s tenure was recognized by the American Society of Association Executives when the society was selected as one of nine remarkable associations that were part of an extensive nationwide study of successful associations. The American Society of Association Executives’ publication, Seven Measures of Success: What remarkable associations do that others don’t, featured the Ohio Society of CPAs as the only state-based membership organization profiled in the seven measures study. Social media fervor is making many organizations far too risk-averse. Organizations are fearful that their membership, customers, or constituency might disagree – loudly, online, demanding a penalty – with any decision or position they publicize… so they do nothing. Fear of risk leads to hesitation, which leads to inaction – and certainly doesn’t lead to innovation. From an improvisational standpoint, the inaction kills me. If we don’t make bad decisions, how can we find good decision? Bad decisions are just bridges to good decisions. We need to change the current leadership trend. We can get ahead of these online movements if we train leaders to anticipate and respond to criticism appropriately. Good leadership needs to share the truth, acknowledge disagreements, and (most importantly) communicate a story. You need to tell a story about how the decision was made, why it was important, and what the consequences will be – a story full of emotion, as opposed to facts and figures – and you need to share that story in a variety of forums. Communication strategies may vary but there is one constant: you can’t be silent and you can’t expect problems will just play out and then go away. We should expect more, and encourage more, from our leaders; they should be prepared to actually lead, make tough decisions, and think about the future. It’s not enough to just be present. Clarke: [00:00:00] Part of the strategy I think for any major decision that’s made boils down to what I always called “how do we tell the story?” How do we tell our story? Peter: [00:00:50] Welcome to episode number 56 and the one year anniversary of this podcast. Time really does fly by. If you think my math is a little off, remember that we launched four episode that very first week. I’d like to take a moment to thank all of my guests for this past year. I greatly appreciate all of you for your willingness to share your knowledge and experiences to help serve those who listen. I have to thank my audience for taking time to listen to these episodes each week and I hope you’ve been able to act on some of the information that has been provided. Personally this has been an absolute blast. I had no idea where this would go when I launched it last year, and to date there’s been over 9000 downloads reaching 48 countries, all 50 states, and 120 U.S. cities. Once again, to all my guests and to my audience, Thank you. Today’s guest is Clarke Price, who’s a retired CEO of the Ohio Society of CPAs. That name might ring a bell because he was the very first episode of my podcast series. Clarke is one of my mentors and I’m very lucky to be able to call him a friend. Clarke completed a 40-year career with the Ohio Society of CPAs, including 22 years as president and CEO of this progressive, nationally recognized Association serving certified public accountant. Before being named CEO, Clarke worked in virtually all areas of the operation, including public relations, membership development, governmental relations, and marketing. The Ohio Society of CPA’s record of innovative leadership was recognized by the American Society of Association Executives when the Ohio Society of CPAs was selected as one of the nine remarkable associations as part of an extensive nationwide study of successful associations. Working with the Good to Great author Jim Collins, the American Society of Association Executives publication, Seven Measures of Success: What remarkable associations do that others don’t, featured the Ohio Society of CPAs as the only state-based membership organization profiled in the seven measures study. In this episode, we discussed challenges that leaders today face. For example, social media and decision making, and provide suggestions on how to overcome these challenges in order to provide strong leadership to your organization. Well with that said let’s get to the interview. Peter: [00:03:31] Clarke, it’s fitting that we’re doing this interview today because when this thing airs it’ll be the one year anniversary of improv is no joke podcast and you are episode number one. And to date, outside of the intro, you still have the most downloads and it’s still downloading each and every month, which is a testament to the information you provided. Not to raise the bar too high here, but it’s a testament of what you brought to that first podcast: information people just absolutely love. So first and foremost thank you very much for taking time out of your busy schedule to talk with me. Clarke: [00:04:08] Well thank you. First off, congratulations on a year. It’s great to see something succeed like this podcast series. So congratulations on that. And I appreciate your very kind comments about the first one. I’m still sitting here somewhat taken taken aback by the fact that I have been so popular for downloads. So it’s great for my ego. You know right now, both in the bit of work I’m doing with a variety of associations and what I’m seeing in my own service sitting on a university board and some charitable boards, I have a concern that is gathering steam about how risk averse organizations of every stripe that I can think of have become. Peter: [00:05:02] When you say risk averse, in what context? Clarke: [00:05:06] Absolutely almost paralyzed for some, but fearful will probably be a better way to do it, that they’re going to make a bad decision, and not necessarily only a bad decision, and they’re going to make an investment or invest in a program that’s not going to succeed. But even that they’ll take a position on minor issues, in some instances, that their membership or constituency, for whatever reason, will disagree with, and that this agreement will then manifest itself in a social media campaign not just criticizing the decision or action that was taken but actively organizing of… It’s not enough just to say we’re upset. There has to be a penalty of some sort. A perfect example: Over the last several weeks, the New York Times has come under attack for hiring a writer who is a climate denier, an identified and acknowledged climate denier, to be a reporter in their scientific section. There is group of people that are now on social media organizing – “as protest, we all have to cancel our subscriptions to the New York Times. Peter: [00:06:42] When you say a climate denier, define that for me. Someone who doesn’t believe in climate change? Clarke: [00:06:49] That global warming is not real. Clarke: [00:06:50] We’ve always had periods of global warming and we’re simply in a cycle. Clarke: [00:06:57] Not that we’re on the precipice of catastrophe, which a lot of people believe. So this group that is saying “how dare the New York Times hire a writer who has an opinion that conflicts with my opinion. And we now have to punish the New York Times, and the only way to punish them is financially. So let’s all cancel our subscription.” And there have been similar movements around other issues. You can see it manifest in the association and not-for-profit environment, where it used to be, going back to the good old days, the only time people of like mind could express their opinion en masse was when they attended a meeting of some sort, in person. Clarke: [00:07:54] So the association board makes a decision. There might be people in the membership that feel strongly that this is the wrong decision. And really the only time they could organize to try and do anything was when they attended a meeting of some sort, generally sponsored by the association. And that just in and of itself had the effect of stifling dissent. Now, with social media, any group can organize. Any person can get out there and, with an aggressive strategy, organize and mount a campaign of whatever sort saying “This decision is wrong.” So it might be they’ve decided to make an investment in some activity that the people think is wrong for the association. And suddenly you have a what used to be called a small rump group, which now becomes a chorus, that are, on a regular basis, hammering how terrible this is on social media. And social media’s reach – how many followers you have – you suddenly start to see these these groups gain traction. So that has the net effect of leaders of organizations saying we absolutely positively have to be sure that this is the right thing. We absolutely positively have to be sure that the membership is going to support us. What I’ve observed in some of the groups I’ve worked with is they’re discussing a step that, in the grand scheme of things, I don’t think anybody would consider major. It becomes “well have we surveyed the membership?” And then it becomes the argument of “how valid is the survey? How broad was this survey? Have we really done the outreach to let everybody know what we’re going to do and give them an opportunity to object?” And what that has the net effect of doing is delaying decisions that need to be made, as well as reducing the risk tolerance of “we’ve got to put a stake in the ground on this issue.” There is lots of change that that is going on across the landscape as a whole that you have to consider. So how do groups respond? One that I think is a very dramatic “we’re going to put a stake in the ground:” Purdue University has just bought Kaplan. Now Kaplan has existed out there for a long time and has had, recently, financial problems, partially due to how the U.S. Department of Education has been cracking down on the for-profit higher education environment. Clarke: [00:10:58] Now Purdue buying Kaplan is a major step. That’s where their board, I think, and they have a very aggressive university president, said we need to enter, dramatically, the online higher education market. Do we build it or do we buy it? If we’re going to build that it’s going to take forever. If we buy it, and particularly if it’s something that’s already established, we can shortcut that timeline and beat the competitors because every university right now, almost every university, is looking at how can we enter the online market. You know they are concerned because of the ads that they see from the New Hampshire – I can never remember the name of a university in New Hampshire that spends boatloads of money advertising their – southern New Hampshire University spends boatloads of money advertising their online programs. Very effective in their advertising. They have an ad that’s running right now where this Southern New Hampshire University blue bus pulls up and they are delivering the diploma to an online student who could not attend graduation. Now I don’t know that they’re doing that for every student but, if I’m sitting out there thinking where am I going to go, I need to advance, where am I going to go? Suddenly, Southern New Hampshire University looks like they care. Clarke: [00:12:36] And so there’s an example where the competitive environment in higher education is becoming very very aggressive. And again an example where a board has really stepped up and made a major step forward. But that’s not typical. Peter: [00:12:55] But this is 2017. We’ve got Southern New Hampshire, WGU… But if I go back to my days at ODU, or even if I go back to my days at Franklin, Franklin was one of the leaders in online education back in 2000. Peter: [00:13:41] That’s taking a big risk… Or is it? Because the big risk was 17 years ago. Is it out there to say that now we’re seeing the effects of online education – What it’s doing. Maybe now is the time to do it? Clarke: [00:14:00] Well it’s a variety of things that are going on. One, there was a great unknown. Was it really going to gain traction, 17 years ago? Clarke: [00:14:08] Clearly it’s gained traction. So 17 years ago, and in the intervening years it was easy to take that position. “Let’s just watch and see what happens.” And you’d have some skeptics… whether the skeptics are “That’s not a good good form of education” or “people really aren’t going to buy it, so why do we need to make the big investment?” You’re right. Franklin university has made a major investment, for a long time, in developing not just a curriculum but competence in developing that that sort of curriculum, and making it very broadly available. You have more and more institutions that are now realizing, hey, there’s money to be made out there. There’s a campaign that I just just read about that is keyed around that theme “It’s time to finish.” Looking at those students, whether it was in a traditional in-person academic environment or online, that withdrew for whatever reason. I don’t have time. I’m not enjoying this. Whatever. The campaign is “It’s time to finish,” saying your credits are transferable and we have programs that are relevant, practical, interesting, engaging, whatever. And so their target is not that student that’s saying “I can’t afford the traditional environment and so I’m going to go online” or “I don’t have time and I want to do it on my time.” This is “we’re going to recapture your interest.” You started at one point saying you were interested and withdrew for whatever reason… let’s capture your imagination again and get you through a program that leads to a degree. So there is a movement in this space now is pushing people up saying we’ve got to do it. They also look at Phoenix, which had huge success for many many years. They’re struggling a bit now. Kaplan being the same way, and there are others out there, that’s leading to “we need to make an investment. We need to take a risk and head down the road.” And that risk factor, going back to where I started this, is boards and leaders generally need to become more risk tolerant. I’m going to look back in time and maybe it’s generational differences, maybe it’s not. There used to be an attitude of “let’s try it and, if it doesn’t work, we’ll fix it, or we’ll stop it.” But we’ve got to take steps to move forward. And now the fear of making a bad decision or having some sort of blowback, in many instances, paralyzes organizations. Peter: [00:17:03] I think ESPN is going through this right now. I read, even from some of the anchors, that said the position that they took on Caitlyn Jenner really upset a lot of their sponsors, and their sponsors pulled out. ESPN just laid off last week about. Peter: [00:17:19] 100 people. They’ve been talking since… you know some of the positions that they have taken… But if we don’t make bad decisions, how can we find good decision? Peter: [00:17:31] This whole improv thing: bad decisions are just bridges to good decisions. Now let’s… I just want to explore this because let’s go back to 2001, 2002, when you’re CEO of the Ohio Society and – correct my timing if I’m wrong – but you decided that we were going to eliminate chapters, and that was not a very popular decision amongst a group, similar to this social media group. You know… bring that decision today. Clarke: [00:18:07] Oh, that is a great example. The decision to eliminate 12 Geographic chapters that were sponsored under the umbrella of the Ohio society of CPAs, each with their own local committees, their own board, they made their own decisions, they sponsored programs. But for a variety of reasons, our leadership – the board at that time – concluded that that wasn’t necessarily an organizational structure that would work best for the future. And after a lot of discussion and a lot of research – market research among members – the decision was made: yes we’re going to eliminate our geographic chapters structure. The rank and file membership, just as the research indicated, did not care. The group that cared, in most instances, were those who were current or recent chapter leaders – chapter board member. And there was a move at that point that was initiated that was critical of the decision that was based on a handful of blast emails. That was in early 2000s – that was the social media response: a series of blast e,ails. That decision in today’s environment… Social media could ramp up the volume dramatically, and volume is… and volume not of support, but of discontent. Suddenly it starts to translate into we have to show up at every event the organization sponsors in person and be that loud volume shouting, “This is wrong. You’re wrong, and you have to change.” It just is able to mobilize people in a fashion that we couldn’t in the past. And one of the things that, to me, has always been a danger so much in social media – in a live environment, when you’re standing there screaming at the rooftops that this is a bad decision, based on your behavior and what I know of you, I may decide you’re an idiot and I’m just going to ignore it. That you’re not credible on this issue. On social media, that raving lunatic component is, in many cases, hidden. Clarke: [00:20:57] And on social media, and we have seen it in a variety of forums, truth doesn’t always play out, in terms of the arguments that are advanced. So social media contributes dramatically to this inaction on major issues by organizations of every type – not just not-for-profit organizations. I think anytime most colleges and universities decide they have to increase tuition rates, there is a concern of “OK what’s the response going to be on social media?” Not just what’s the response going to be from students, but then who’s going to gin up what sort of negative response or extreme negative response in the social media environment. That’s a very real issue. We’re seeing it across organizations of every type, the Times being one example. There’s protests going on right now that are anti-Wendy’s hamburger chain because Wendy’s has not signed on to some group that is advocating for better treatment, better wages, better conditions for those who picked tomatoes. That translates into “stop buying at Wendy’s. Peter: [00:22:29] The ol’ boycott. Peter: [00:23:06] So what should… in thinking about “back in the day,” I remember you and the board, or you and the chair, went to all the chapter boards and met with them face-to-face and had this discussion on why it needed… there was some dialogue that went on. But in today’s environment, we’re not having that one-on-one dialogue. I’m posting and I’m and gathering the masses… then as a leader what should Wendy’s, what should the Times, what should they do? How should they respond to the noise out there? Because I think part of it is the non-response. Clarke: [00:23:46] I agree that non-responses is a deal killer for organizations. Failure to respond appropriately. Peter: [00:24:00] Well, what’s appropriately? Clarke: [00:24:02] One, with the truth, where it’s necessary. Two, where the criticism is valid, acknowledge it. How much heat did United Airlines take for the CEO’s initial response on the unfortunate incident occurred on United Airlines flight? Clarke: [00:24:29] It took them a couple of iterations to get out there not presuming that their people were right. And that’s always a risk because they don’t want to upset the Union. Clarke: [00:24:42] Or their employees, if they’re not unionized. But they’ve got to acknowledge we were at fault or we made a bad decision. But the number one issue is you’ve got to lay the facts out. Clarke: [00:24:59] And how it is done. When you talk about when the chairs and I would make the rounds and tell the story, it was always “Here’s how the decision was made. Here is the process we went through. Here are the points that drove the decision, over whatever that decision might be.” It used to be you’d do that in person and you’d publish an article in whatever your monthly newsletter or whatever is. Now the communications strategy has exploded because you still have to do those in-person events where you can, depending upon the issue, the environment you want to go to the media and use what are called traditional public relations strategies to get them to help tell your story. You use your own publications. You have to use your Web site. And how can that be most effectively done? And the one that I think most organizations struggle with today is how can we leverage social media to tell our side of the story. Clarke: [00:26:07] And the strategies that then unfold are do we or don’t we respond directly to the negatives that are occurring by the anti component on social media, or do we concentrate on simply telling our story and relying on social media itself to spread our version? Different organizations, different approaches, different circumstances, different situations dictate how you’re going to respond to that. So the PR side of it is incredibly important in today’s environment. But the one thing that that is true across every organization: You can’t be silent. You can’t think oh this is going to play out and go away. Peter: [00:26:53] Let’s just turn our backs and eventually people will forget all about it. Clarke: [00:26:59] That, in today’s environment, is is not workable. So going back to where I started with this, it means organizations – and whether they’re not-for-profits, whether they’re charitable, or whether they are what we’ll call traditional businesses, you have to be thinking about “how do we respond in today’s environment? What are we going to do? What are we going to do that adds value? What are we going to do that makes us relevant? What are we going to do that allows us to make the best use of the resources, primarily financial or manpower, that we have available to better position us for the future?” And that better position us for the future I think is the critical issue that most are afraid to address. What I observe is people are very slow to accept changing marketplace reality. New competitors – what used to be partners now become competitors. And what are we going to do and how are we going to respond? And that means you’ve got to be prepared to take some risks. And going back to where this all started, too many groups are risk averse and they think we’ll wait this out and we’ll see what’s the really right thing to do. And if I’ve been with some groups that have made the decision we’re not going to act right now, and then somebody else acts and they have a hiccup or a failure. Their board members say see we made the right decision, when they could have moved forward if they’d been just a little bit aggressive, or very aggressive. Depends on the group. Those are issues that are making leadership today very challenging. Peter: [00:29:03] As you’re describing this, it’s the leadership by hesitation. Peter: [00:29:10] We’re going to have that pause, and you know I’m a big believer that businesses need to take on risk. They can’t be risk averse because if you look the same way you did last year then you’re probably not gonna be around much longer. By the way, you have a Blackberry on you? Kind of along those lines. When did we go to the thinking that we can’t make mistakes? When we go to the thinking that we always has to be right and 100 percent perfect? Because that’s impossible. And if we’re driving leadership in that manner… that’s not a really decent picture of leadership moving forward. Clarke: [00:29:50] Pete, you’re right – it’s not. But, unfortunately, it’s a realistic picture of what leadership looks like today, and I think is going to influence leadership for for a long time. And what drove the change? I wish I had an answer. I thought about that a lot. I think part of it is driven by the incredible time pressures that everybody is facing today. And they’re not as vested in outside organizations, or their own organizations, as they used to be. Nobody wants to… in today, it’s the rare exception where you find somebody who is willing to be identified with failure. And boy it’s a really rare instance where somebody’s not just willing to be identified with the failure but willing to be identified as that failure was my idea. Or I supported that failure. I’ve seen a number of instances where people who were involved in a decision to do something that turns out to have been a failure or a bad decision – they won’t even try to set the record straight of why we made that decision. Even if it’s saying we had bad research. It’s they just don’t want to be associated with it. That then rotates back to inaction. Peter: [00:31:28] We’re fearful of our jobs because if you made the bad decision – gone. Peter: [00:31:34] So why am I going to make them – why am I going make any decisions if there’s going to be those negative repercussions to me that I’m going to lose my job? Then yeah we won’t take responsibility. We won’t take accountability. And quite frankly we won’t think… we’re not a leader. Peter: [00:31:51] We’re an order taker. Clarke: [00:31:52] In the corporate environment where we’re making corporate decisions, people are loathe to be identified with that failure. Whether it leads to your fired or whether it leads to the whispers of “Peter, Clarke was behind X and you don’t want to involve them in this project, or take what they say with a grain of salt.” So there are downstream repercussions that then lead people to, I think and I observe, not necessarily be supportive of risk opportunities that are out there. Peter: [00:32:34] Right. Because if I’m going to support you… What’s in it for me? Clarke: [00:33:23] If you want to step back and look at a little bit pragmatically, in many respects, social media is the newspaper of old. When I began my career in 1969 as a public relations guy, the primary target that we had for everything was print – the newspapers. Newspapers are less and less important today. Clarke: [00:33:57] Unfortunate but it is a reality. So now you end up looking at how do we harness the various platforms that are out there? And part of the strategy I think for any major decision that’s made boils down to what I always call “How do we tell the story?” How do we tell our story? Clarke: [00:34:20] How do we tell the story of how the decision was made, why is it important, what are the consequences? In a variety of forums, and whether that is social media, whether that is on Web sites, whether that is in print, whether it is the talking heads standing up in front of a group of people, whether it is webcasts that allow you to do that – all of the strategies that are out there. They need to be factored into the plan. And today, for many people, for many groups, all of that seems overwhelming and what they decide is lets wait, or lets punt. How critical is this really? What are the consequences of inaction? What we have to do to fix it is get our leaders thinking about the importance of the future, in one instance, the import that being appointed to any leadership role means you actually do have to lead. It’s not not enough to simply be present as a leader. Let’s put a broad fence around leader – as a leader you have to be prepared to actually lead. Make decisions; make the tough decisions. Think about the future. Where are we going? What is important for this organization? How do we confront the negative challenges that loom out there either today or on the horizon? How do we keep this organization or this entity relevant to whatever constituency we serve? Whether it is members, whether it is donors, whether it is customers, what are we going to do to ensure that we keep relevant? And that means you’ve got to be constantly scanning the competitive horizon. What are the things that loom out there that are going to impact us, and then either how do we anticipate or, in the latter case, how do we respond? And how do we respond may actually be too late. The key is anticipation. Peter: [00:36:41] Anticipation, and I’m going to back to something that you said about telling our story. So as I think of the person on social media… they’re emotionally charged. They may say how is this going to affect the families, these families, yada yada yada. My question is, when corporate America is responding to this, are they telling an emotionally charged story or are they telling a story wrapped around complete data with no… analogy to put it in a way that starts that motion. Is it a data dump or is it a story that has a human factor to it, is my question. I have been doing a ton of reading lately about one of the challenges that corporate America has is telling a story that’s just not all data and facts and statistics and graphs. It’s creating that analogy to help with that emotion of who we are. Clarke: [00:37:45] And how is it going to affect you. Clarke: [00:37:47] How does our action or inaction affect you? Clarke: [00:37:54] You as members, donors, customers – choose what you will. Telling the story, I have always felt, is the critical step in, at a minimum, gaining understanding – The desirable is gaining support. All too often, people think “they don’t care.” Whatever the group they are serving or affecting, they’re not going to care. In today’s environment, people care. Clarke: [00:38:30] And particularly social media gives them a platform to express how much they care to a broad audience, and also a platform to say this affects me and this is wrong. Peter: [00:38:46] And this is why we emphasize the emotional part of story. So, as a leader, do you point out an anticipation is we know that all decisions we make are not going to be 100% supported, so in that board case the anticipation… what would be the negative response out there and how we respond to that within our story, in a manner that’s just not facts and figures and graphs and stuff? Clarke: [00:39:11] And how can we tell that story that’s going to lessen or mitigate that negative response? Clarke: [00:39:21] How do we get people on our side? That is critical. How do we get people on our side? How do we generate excitement and enthusiasm for what we’re doing? Rather than this is wrong, this is great. And then you get into OK how do we manage competing voices. You’ll have a negative voice. How do we get the volume from the positive voice to drown them out? Peter: [00:39:48] Why does it always take five times more of the positive voice over the negative voice? Clarke: [00:39:52] Well, primarily, I think because the negative voice generally has great passion behind it. And a positive voice, generally speaking, is slower to respond because there’s not as much passion around whatever the issue is. And look at how the response has been to President Trump. There are detractors of the president today who are very loud in their volume. Clarke: [00:40:26] Many of them through social media. It seems to me that supporters of the president they seem to come in waves of when the volume goes up, where the detractors their volume is constant. I’ll use an example of a group I am aware of on social media that has created a forum within a Facebook group for people to express frustration, concerns, anger. All, I will say, in a very positive manner. They’re not “we must rise up and do whatever,” but it is primarily about expressing frustration and sharing articles that they find… I’ll give one real world example that I’ve used in a variety of times. I will freely admit that I was in the Never Trump school during the election. Not necessarily a raving fan of Hillary Clinton, but definitely in the negative school when it came to President Trump. There is a group of former friends and colleagues – CEOs of other associations – that got together a variety of times a year, either for dinner or occasionally to play golf. Two of the group – there were four of us – Two of the group were pro-Trump as a candidate, but primarily because they were violently anti-Hillary Clinton. Clarke: [00:42:42] And just face a series of challenges among friends. That was frustrating. Clarke: [00:42:53] It was was very frustrating to me, and I have experienced it play out similarly in a variety of other forums. As I talk about it, I have other people that tell the same story of, to a degree, that they’ve never experienced before, and particularly in presidential elections, that the polarization that occurred – that divided friendships. And in my case has had an impact. That’s a concern. That’s a very real concern. And again, it gets to telling the story. And everybody has the right to – I’ve always felt everybody has the right to their opinion, and I have always fought the urge to think “how stupid is he or she?” when they voice an opinion that I don’t agree with. I had to remind myself they are entitled to their opinion. And the notion that I’m going to convince them that their opinion, particularly on political matters, is wrong and they need to change how they’re going to vote is an absolute wasted effort. Peter: [00:44:01] Yeah I’ve had this for a number of years, where there are some of my friends who we can have the point-counterpoint discussion in a very respectful way and, at the end of the day, go okay, you got an opinion and we don’t agree. OK let’s go have a cocktail… versus some who are just like “you’re an idiot to even think that way.” Well we’re all different – we all think differently, but we’ve lost that respect. Clarke: [00:44:32] We have. And it becomes very broad in its effect and impact. I’m a former lobbyist. One of the changes that I observed in the legislative process over time was you used to be able to sit in the gallery and watch debate on a bill. And, Pete, you and I would be members of the House and in that debate the casual observer would think you and I are on the edge of coming to a physical confrontation. But on the very next issue that was up for debate, you and I were on the same side working together and appeared as lifelong friends. Clarke: [00:45:22] What’s happened over time is so many people have established a litmus test, and it might be on a social issue, it might be on taxes, and choose what it is. And if you don’t support my opinion, I don’t want to be identified with you over anything. Clarke: [00:45:50] And I seriously believe that that has led to the dysfunction that we observe in our elected bodies today. The notion of leadership and compromise has become a really really dirty set of words in the political environment today. Yes there is occasional compromise that occurs, but where we used to have debate on an issue and give and take and compromise rarely happens today because of these positions that have been staked out. And that doesn’t just happen in the legislative environment. It also happens in the community and social environment that’s going on here. Whether it’s the popular ones today – immigration, taxes, homeless… I mean choose the issue that you want – people stake out a position and then proselytize that everybody has to share my opinion, rather than think maybe there’s some middle ground in this. Peter: [00:47:05] We forgot what the middle ground was. Peter: [00:47:18] “Because it’s my way or the highway.” And that’s not leadership. That’s ego. Clarke: [00:47:23] It is. And then again looping back to so social media environments. And then there is this tremendous concern about how is my base – not my constituents, but my base – How are they going to respond to the decision that I make? Clarke: [00:47:45] Today there is this fear that the extreme, whether it’s the extreme right of the extreme left, is going to get behind a competing candidate because I haven’t voted the right way. Rather than you elect me to make decisions on your behalf and I’m going to make the best decision that I can. And that’s unfortunate, and it loops all back to leadership. And who’s going to stand up. Tell the story and try to rally support for what we’re trying to accomplish. In some respects… I had this conversation just yesterday with someone that some think the master of that is President Trump, who does the rallies where he tells his story. Clarke: [00:48:42] As I think about that and try to be objective, I can agree that he’s out there telling his story and rallying support. Unfortunately, he’s telling his story to his base and not necessarily trying to expand the base. Clarke: [00:49:02] And get more people to say “I understand that.” And I know there are some that may be listening to this that say “you’re absolutely wrong – he is the great communicator and he is telling his story and people are buying it.” I’m sorry I disagree. Clarke: [00:49:29] And I think part of the role of leaders is to moderate that disagreement. One, to provide the forum for both sides to be put out on the table. But then leaders need to be prepared to take the heat, tell the story, and then, in some instances, admit it was a bad decision and move on. Fix it and move on. But right now, we have people that are frightened of the negative response. So, consequently, they don’t do anything. Peter: [00:50:03] Through this whole conversation, we’ve talked about if it’s a wrong decision fix it and move on. It makes me think of two things: one, Steve Jobs, that was his mentality. You know if it’s not going to work, bail. Just move on. But I still go back to when I was living in Atlanta years ago, and I still remember when New Coke came out and I think it lasted maybe 30 seconds. Peter: [00:50:28] Because even though they did the market research, even though they did all that and invested into it… But when the mass public got a hold of it and the response negative to it… bad decision, move on. Peter: [00:50:40] Let’s get it fixed. Clarke: [00:50:41] It’s off the market now. Clarke: [00:50:43] OK. We listened to you. Now we’re moving on. Clarke: [00:50:48] Leadership, in this sense, today, is really very difficult. It takes a lot of effort. It takes a lot of thought. It takes a lot of planning and strategy of how are we going to tell the story, which I keep looping back to. But what are we going to do to continue to be relevant? And whether that is improve our product, improve our conversations, make a change… right now in the association and membership organization environment, I think we’re starting to see a movement of mergers and consolidation. That’s an emotional issue to some. National organizations are gobbling up their state structure again. Clarke: [00:51:42] A variation of that chapter issue. Why do we need six organizations surveying this specific constituency? And so you are seeing consolidation. It started a number of years ago over trade shows – the big trade shows, primarily in Las Vegas, Orlando, Chicago, locations like that. I don’t care what the industry is. There would be several different organizations that, over the course of a year, would have a trade show. And there became a movement of well why don’t we co-sponsor this show and make it bigger? And then it became Or why don’t we buy this trade show? You know our organizations are serving the same industry… Why don’t we merge? And that brought out strong responses from members. “I don’t want to lose my XYZ association or be part of the ABC association.” But it happened and I think there’s going to be more of that, partially driven by relevance, or lack thereof. Part of it’s going to be driven by economics. Clarke: [00:52:59] And the competitive environment. And those are all going to be really challenging to deal with. Peter: [00:53:05] Well with the lack of relevance, if you don’t have membership or new members who are paying the dues… then it turns into a financial decision. And then the whole economics of it is Are we relevant? And I also think it goes back to Are you telling your story? Clarke: [00:53:24] Again, my focus is voluntary membership associations because that’s what I built my career around. I’ll give you an example of the shift that is occurring. A number of years ago, the American Society of Associations worked with Jim Collins, the author of Good to Great, to do a major research project across associations that led to publication of a book called Seven Measures of Success. Peter: [00:53:54] I’ve got that book. Clarke: [00:55:32] That then contributes to inaction and being averse to taking risks and making changes, which is where I started this. Clarke: [00:55:43] But that’s what’s going on today that makes being a leader incredibly challenging, and makes the need for strong leaders – people who are willing to say I’m going to take that chance. Clarke: [00:55:58] I’m going to take the chance on making this decision. That’s one of the things that I have so enjoyed about my time serving on the Franklin University board. It is board comprised primarily of business leaders. Clarke: [00:56:15] A number of us are retired but all of us held senior businesses positions. We are blessed with a very strong president who brings issues to us, but a board that studies issues in great depth but is willing to say “we need to try this,” and if it works out to be the wrong decision we’ll fix it or we’ll stop it. There are few boards that I am involved with right now that I feel strongly about but have that sort of an orientation: a willingness to say the environment is changing – what are we going to do to change? What new roads are we going to head down knowing that it might not succeed? You do your research to think it’s got a good chance of succeeding and it gets debated in depth. Some might say ad nauseum, but then it becomes we’ll fix it if it’s a bad decision. And people are afraid, too often today, that I won’t get the chance to fix it. The volume will become so great that I have to step down. I have to resign from the board and have to resign from my position. And the CEO in a membership organizations becomes a lightning rod, and often they are the person that gets blamed. And I always said I get paid to take the blame. Clarke: [00:57:48] But now it is not enough to say you made a bad decision. We have to replace. And that’s happening very frequently. Peter: [00:57:56] Yeah I can only imagine that. Wow. Clarke: [00:58:00] Yeah you know it is interesting to be the outsider sitting there with a volunteer board and just observe the behavior. Who’s there? Who talks? Who doesn’t talk? Who, if they’re prompted, will respond and respond with something that’s reasonably strong intellectually? Who’s just along for the ride and a free lunch? Who’s prepared? Clarke: [00:58:32] You can tell who’s prepared, generally speaking, and who isn’t prepared. To me that’s one of the most important attributes for leaders: being prepared. Peter: [00:58:51] And if it’s something that you might not know a lot about, then go find out. Clarke: [00:58:58] And learn it before it’s going to be discussed. Clarke: [00:59:01] Don’t rely on others in the discussion to, perhaps, educate you, because more often than not it’s not going to be a real education. That’s the responsibility of leadership. And every board has people that are engaged. Every board has people that are not engaged. Peter: [00:59:25] And the ones who are not engaged. Clarke: [00:59:28] Shouldn’t be there. Clarke: [00:59:30] Every board is different. Sometimes they’re there because they’ve been a major contributor, or their employers been a major contributor. Sometimes they’re there simply because they’ve been a soldier rising through the ranks. You get drafted and you serve on a committee and, before you know it, you have hung around and you haven’t done anything stupid or bad. You become chairman of the committee. Maybe move to another committee. Maybe it’s well he was chairman of the X committee, or she. We need to bring them up onto the board. And before you know it you’re on a board, and suddenly you get a phone call saying we’d like you to start through the chairs. And if you really step back it’s because you haven’t created any problems, you haven’t been controversial, you haven’t really contributed. But you have shown up. And people are busy today and those that are really engaged, many times, are saying I don’t have the additional time to really invest in being an officer or go through the chairs or whatever. Subsequently, many organizations get people as chair that really shouldn’t be. And that’s been a fact for years. It’s been a fact forever, I think. Sometimes you get one of those people when you can capture their imagination and get that spark going and get them to invest in getting smart and being a leader. You take them to a conference. You give them a book to read. And suddenly then they get energized…. but all too often that simply doesn’t happen. Peter: [01:01:18] In an interview I recently saw with Simon Sinek he was talking about leadership. How do you measure it? How do you do it? And I love this: “Leadership is something that you practice every single day. Every single day.” You work on something, work on something… It also reminds me of a TEDTalk of a professor from a Welsh University, Philip Kim, talking about how these small wins lead to great gains. And I think some in leadership, maybe in the board leadership, are not thinking about that on a day to day basis. Peter: [01:01:54] They’re not practicing it… I love when someone says “I’m not a leader right now.” And I go to you work with people? “Yes.” Do you have an effect on somebody else? “Yes.” Then that you are a leader. It’s the effect that you have on the other person, and I didn’t make that cognizant recognition until this interview with Simon Sinek that I’ve watched many times. But leadership is not authority. Leadership is the way you affect people. And it doesn’t matter: you can be at the highest level and you can be at the lowest level, but that lowest person can have an effect on somebody else. That’s leadership. It goes back to attitude and it goes back to coming in ready to work, ready to do your job, and not being the dark cloud. Clarke: [01:02:42] You’re using that example. I used to say that the average board member simply shows up – a good board member shows up and they’re prepared. They’ve at least read the agenda and hopefully any supporting material that’s there, or done some some research on their own. An exceptional board member actually does something between meetings. They’ve got an assignment they’re going to fulfill. They call to talk about an issue that is percolating through the organization. And then the one-in-a-hundred fantastic board member will between meetings, or even at a meeting, bring up an issue that’s out of the blue. Peter: [01:04:02] How are we going respond, and let’s make sure we respond. Peter: [01:04:06] I think a lot time we think how we will respond, and we come up with the idea, and then we come back to reality. Clarke: [01:04:12] And then it falls to the execution of it. Clarke: [01:04:14] Do we have a culture? Do we have a process that allows us to translate idea to reality? Peter: [01:04:20] Right. Will the board support it? Clarke: [01:04:21] Yeah. And then how are we going to try to tell the story. That’s it. Peter: [01:04:28] Clarke, I miss the hell out of you. Peter: [01:04:31] I love these conversations. This is the quickest hour that’s gone by. I love the insight. I am going to have to get you on one of these podcasts episodes and we’re just going to talk about the 30 years of your travels and some of your favorite places that you’ve visited and some of the best restaurants restaurants that you’ve eaten at. Peter: [01:04:53] And that could be an hour in itself. So thank you for taking time. Always enjoy our conversations and I look forward to our next one. Clarke: [01:05:03] Pete, thanks very much. This was great. 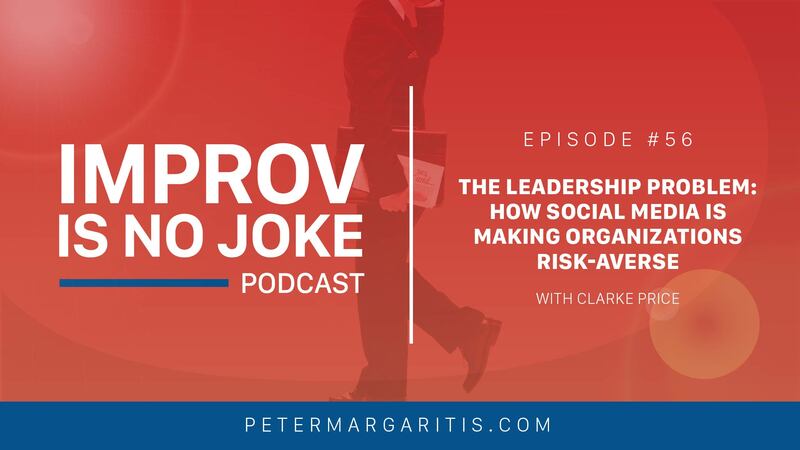 Peter: [01:05:08] I would like to thank Clarke again for spending time with me on sharing his thoughts on the impact that social media is having on today’s leadership style.Listen, learn, and learn. I have partnered with the Maryland Association of CPAs and the Business Learning Institute to bring an exciting new learning opportunity for accounting professionals to earn CPE credits. You can earn up to one CPE credit for each completed podcast episode purchased for only $29 through the American Association of CPAs and the Business Learning Institute self-study website. The podcast episodes are mobile friendly. Open your browser on your smartphone, tablet, or computer, Go to the MACPA and BLI self-study account, and listen to an episode. Take the review and final exam while you’re working out or after listening to an episode on your commute to and from work – It’s that easy! While all Improv is no Joke podcasts are available on my website, only those purchased through the MACPA and BLI self-study Web site are eligible for CPE credit. You can get detailed instructions by visiting my website at www.PeterMargaritis.com and clicking on the graphic “Improv is no Joke for CPE credit” on my home page. I hope you enjoy this exciting and flexible new way of earning CPE credit. Remember you can subscribe to my podcast on iTunes, Stitcher, and Google Play. If you’d like to purchase an autographed copy of my book Improv is no Joke: Using Improvisation to Create Positive Results in Leadership and Life, for $14.99 with free shipping, please go to my website, PeterMargaritis.com, and you’ll see the graphic on the homepage to purchase my book. Please allow 14 days for shipping. You can also follow me on social media. You can find me on Facebook, Twitter, LinkedIn or Instagram. In Episode 57, I interviewed Jason Michaels, who is a professional entertainer, speaker, and author with an astounding experience in the art of deception. A storyteller by heart, Jason loves to blend impossible mysteries with unforgettable tales. Thank you again for listening and remember to use the principles of improvisation to help you become a stronger leader.